PLYMOUTH — The Michigan Manufacturing Technology Center will unveil a lightweight replica car, military and specialty vehicle frame this week at the World Congress Experience event, hosted by SAE International. The frame is comprised of aluminum, magnesium, carbon fiber and advanced high strength steel to provide the best combination of light weight, high strength and cost effectiveness for each component. MMTC officials said one innovation used in the frame is the joining techniques used for the variety of materials that include structural adhesives and mechanical fasteners with inert washers. The result is a frame that offers 450 percent stiffer bending, 150 percent stiffer torsion, a 33 percent lighter weight and competitive pricing. A major factor in the cost consideration relates to assembly of the frame, which requires less than two hours for two technicians compared to steel aftermarket frames that can exceed 40 hours for highly skilled welders using dedicated fixtures. All-steel frames also must be primed or powder-coated, adding cost and complexity to the assembly process. The frame was designed in response to the growing market need for alternative lightweight vehicle frame options. Multiple organizations were involved in the process of creating this innovative lightweight frame, including the MMTC, Lightweight Innovations for Tomorrow, the Institute for Advanced Composites Manufacturing Innovation and the University of Tennessee Center for Industrial Services Institute for Public Service. The project was conceived and led by Gregg Peterson, MMTC principal materials engineer, an accomplished engineer, inventor, mentor of emerging talent, and successful entrepreneur whose 40-year career includes receiving 12 patents in multi-disciplinary fields. Additionally, as a Lotus Engineering representative, he was instrumental in technology transfer with NASA, successfully adapting software from the aerospace industry to automotive. After considering dozens of body frames, the 1963-67 Corvette (C2 second generation Corvette design) was selected due to its overall popularity around the world. Further specifications for this lightweight, strong and safe replacement frame for the C2 Corvette were developed with Dynamic Corvettes, a Corvette specialist based in Saginaw. Detroit Engineered Products, an automotive design firm, produced all CAD models and performed the finite element analysis. Pennex Aluminum Co., an auto supplier based in Wellsville, Pa., selected the material, built the tooling and supplied extrusions for the front and rear energy-absorbing modules on the frame. Due to the wide demand for lightweight frames like this, the goal was to make a frame that could be easily “morphed” into virtually any wheelbase, vehicle length and width without requiring additional tooling. For this project, two frames that shared key structural parts were developed: a short wheelbase, narrow body frame, and a larger frame for heavy duty military trucks. This “dual use” approach provided economies of scale for all end users that help reduce the frame cost. Another challenge in the design process came from the joining requirements, which included issues such as parent material degradation, sealing the mating surfaces from road contamination, non-robotic (manual) processes and cost effectiveness. As a result, the team decided the best solution would be a combination of adhesives and fasteners with inert washers. Beyond replica cars, this frame also has immediate military applications. A number of companies working with the Department of Defense have identified the need for a lightweight frame to be used in military vehicles to effectively lighten loads and increase fuel economy. 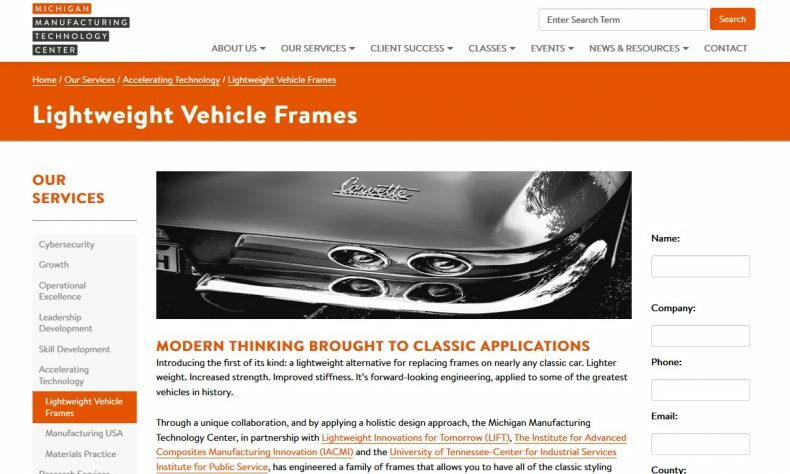 Commander Innovations, a Michigan-based military supplier, is one such company pursuing this frame concept for use in a military vehicle under development, working in a collaborative agreement with the Michigan Manufacturing Technology Center. To learn more about the lightweight aftermarket frame, visit https://www.the-center.org/Our-Services/Accelerating-Technology/Lightweight-Vehicle-Frames. MMTC offers personalized consulting to Michigan manufacturers. It is affiliated with the National Institute of Standards and Technology (NIST) and is part of the Hollings Manufacturing Extension Partnership. The Center also is closely affiliated with the Michigan Economic Development Corp. with the shared goal of making Michigan businesses vibrant, driving GDP growth and creating new and lasting jobs. For more information, visit http://www.the-center.org.